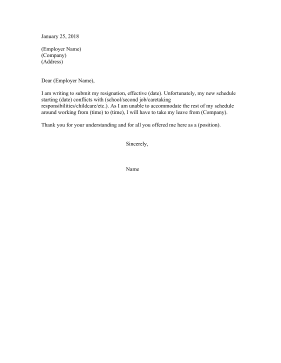 Perfect for when multiple projects, jobs, or classes no longer line up, this resignation letter cites scheduling conflicts. I am writing to submit my resignation, effective (date). Unfortunately, my new schedule starting (date) conflicts with (school/second job/caretaking responsibilities/childcare/etc.). As I am unable to accommodate the rest of my schedule around working from (time) to (time), I will have to take my leave from (Company). Thank you for your understanding and for all you offered me here as a (position).